Ready to start off 2019 by creating some fun memories with your child / children along with the rest of the members of the longhouse? 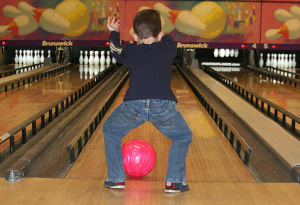 If so, then make plans to attend Bumper Bowling, which is scheduled for Sunday, January 13th, 2019, from 1:00 – 3:00 PM at Roseland Lanes located at 26383 Broadway Avenue in Oakwood Village. It is easy to find as you take Pleasant Valley Road due east until you reach Broadway Avenue, turn right and the bowling alley is located on your left. Cost for the event is $12.00 per person. Included with paid admission will be two hours of bowling, shoe rental, one slice of pizza, one soft drink and a cup of ice cream. Our two hour session of bowling will start promptly at 1:00 P.M., so it is strongly recommended that you arrive by 12:40 to complete the check in process, get your bowling shoes, select a bowling ball, etc., in order to maximize your time on the lanes. Please note that this is a very popular event and it usually sells out quickly. In order to register and pay for this event, please scroll down on this page and input the applicable information under the heading “TICKETS.” We are testing a new system which will enable you to register and pay for the event in advance via PayPal. A 3% handling fee is automatically added to the PayPal option due to the fees charged by PayPal. If you would prefer to mail a check prior to the event, please follow those instructions. If you prefer to pay cash upon arrival to the bowling alley, you can do so, however, we would greatly appreciate exact change (cost is $12.00 per person). Don’t forget to also bring a dollar for the Dads’ patch. The new system will generate a ticket for each person attending the event when payment is received via PayPal. If you select this option, please be sure to be prepared to show the e-mail containing your tickets’ QR code which we will use for the check-in process. You can print the e-mail containing the tickets or simply have them ready to show on your smart phone. Your patience is appreciated as we try out this new system.